Marketing is very important to connecting with buyers and moving them through the various stages to a sale. The better marketers can connect with their audiences, the stronger a bond that can be build and those stronger bonds create more loyal shoppers. This of course results in increased sales and revenue. One of the best ways to understand your audience is by creating profiles of them. While we use to create these profiles based on general classes of customers (much like a buyer persona), technology now gives us the ability to create these shopper profiles at the individual level. We can now collect and build a profile about a specific person, rather than simply lumping them in with a group of similar shoppers. The opportunity to connect at a more personal level is huge. 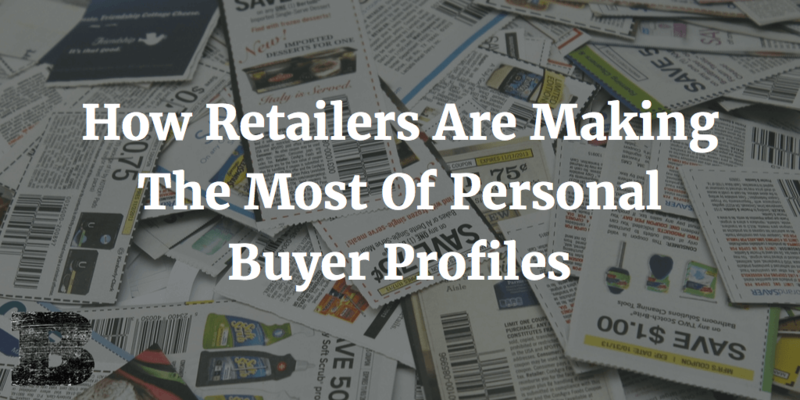 Building these individual profiles is a challenge for most retailers. They simply don’t have the technology, time, or human resources required to create accurate customer profiles at the person level. For most, this type of ultra-focused profiling is still out of reach. But the constraints that hold smaller retailers back don’t apply to the big guys. Big stores like Walmart, Target, Home Depot, and other big names have the resources to build very accurate customer profiles. Personal buyer profiles are created by linking all purchases made from a single credit card together. The more someone buys, the more data the retailer can add to their profile. They can even link profiles from the multiple credit cards you use together, by comparing purchasing trends and history along with the name on each card. This purchase history don’t just allow retailers to understand WHAT you buy but also gain other insights into your purchasing. They may find that someone always buys toilet paper on the 3rd Saturday of each month or that their preferred shopping time is 8pm on those days. Maybe they like shopping at the uptown store on weekdays while they prefer the downtown location on weekends. The insights marketers can gain from building shopper profiles allows a level of individual customer understanding we couldn’t achieve in the past. We can now build super accurate profiles of individual shoppers. But why does that matter? Like any data or insight we gather, these things only help if we can take action based on this new knowledge. And big retailers are doing just that. This knowledge about specific individuals allows marketers to target them in a direct and personal way. They can send coupons not only for the specific items they buy frequently, but those coupons can arrive at the specific time of month when they usually purchase them. Imagine you buy paper towels around the 4th Saturday each month. Earlier that week, Target can now send you a coupon for paper towels. But we can take that a step further too. Maybe they’ve identified your paper towel buying habits but also notice that you haven’t been in to buy any in a couple months. If they sent you a coupon for paper towels right before they knew you’d be buying them, what are the chances you’d go to Target to buy them rather than wherever you’ve been going the past couple months? Personal buyer profiles allow marketers the ability to be very targeted in how they reach out to customers and appeal to them on the individual level. They can mean millions or even billions in extra revenue for a retailer. In a world where marketers are increasingly able to target their audiences with precision, personal buyer profiles allow a new level of connection between large retailers and their customers. By monitoring shopping habits, retailers can provide shoppers with the most relevant deals and information possible. Through the wonders of technology, smart analytics, and applying what we learn from those insights, our marketing can connect with customers better than ever before.